Nineteenth century Rome was not the uneventful place one may imagine. Rome of the 1800s saw Mazzini, Garibaldi, and their Masonic cohorts dare to assault the Vicar of Christ and send him into exile. It saw fickle mobs capable of murdering priests and desecrating Churches, and heard such slogans as “Death to the Jesuits!” and “Down with the Pope!” shouted in the streets. Public life in Rome was becoming such that everything was stained with this anti-ecclesiastical attitude. Of the institutions and customs open to particular infection from this disease, perhaps none was more susceptible, by nature, than the infamous Carnival. The Roman Carnival had long been a problem because of the excesses of the excited revelers. What should have been an innocent “farewell to meat”1 in anticipation of the rigors of Lent, had become the occasion for immoderate indulgence and profligacy. In the midst of the Carnival of 1835 there walked about the Corso, in the midst of the revelry, a priest with his trusty but timid lay side-kick. Giacomo Salvati, the side-kick, had his apprehensions about what he was doing that day with his spiritual mentor. Sure, he was a saint; sure, he was a miracle worker and had proven his divine election many times before, but this was ridiculous . The two of them hardly fit the scene: Everybody else was colorfully dressed; they donned somber black. Everyone else was making merry; they were trying to keep in the presence of God. Salvati knew that his mentor hated such impure festivity, so what were they doing amid all this sinful reveling? “It is good for a man when he hath borne the yoke from his youth.”4 There are saints who were great converts from a life of iniquity, like Sts. Paul, Augustine, Camillus, or Ignatius of Loyola; and there are saints who were conspicuous for following the counsel of Jeremias, bearing the light yoke of Christ from their very youth, never throwing it off by sin. In this latter category belong saints like Gerard Magella, Gertrude the Great, Thérèse and Thomas Aquinas. St. Vincent Pallotti belongs decidedly in the latter category. His confessor, Fr. Fazzini, declared that he never committed even one venial sin! Vincent Pallotti was born on the anniversary of the founding of Rome — April 21, 1795, at 11:15 AM. On the day following, he was reborn, at the baptismal font of San Lorenzo in Damaso, a parish in Rome’s most densely populated quarter. His parents were Pietro Paulo Pallotti, a noble man of Umbrian descent, being born near the same Cascia that St. Rita made famous; and Maria Maddelena de Rossi, a Roman woman of exemplary piety. The Pallotti family produced a number of vocations, including five who became cardinals of the Roman Church.5 Both Pietro Paulo and Maria Maddelena were devout Catholics who wished to bring up good Catholic children, a wish that God gave them ample opportunity to act out, for He blessed them with ten children. Other than a few recollections of them that St. Vincent passed on, whatever treasures this exemplary Catholic couple stored up in heaven will remain, for the most part, the secret of the King‡ until the Day of Judgment. But their son’s virtues and the interior workings of God’s grace in his soul became so manifest that he is canonized by the Church and publicly held up for imitation, his incorrupt body still bearing witness to his immortality in heaven. Perhaps the one dark spot on his early years was his apparent lack of academic aptitude in the Piarist8 school he attended, San Pantaleo. The Fathers thought it a pity that such a pious boy should be so dim. But a triumph of supernatural light over natural darkness was occasioned by this state of affairs. A novena to the Holy Ghost instantly settled the problem, so much so that his teachers were overwhelmed at the change in dull little Vincenzo. In 1807, Vincenzo left the Piarist school to pursue higher studies. He attended the Collegio Romano (Roman College), which was more like an advanced high school than it was a college in the American sense. Founded by St. Ignatius and counting among its alumni Sts. Aloysius Gonzaga, John Berchmans, Camillus de Lellis, and Leonardo a Porto Maurizio, this school had a glorious Jesuit history that made it a landmark of the Counter Reformation. However, due to Masonically engineered suppression of the Jesuits in 1773 by Pope Clement XIV, the College had fallen on hard times and was only a shadow of its former self when Vincent took classes there. He studied grammar, rhetoric, and the Latin classics at the Collegio. He became particularly adept at composing verse in Latin, and won at least one prize for this art. But this prize went where all his other academic awards had always gone, to an image of our Lady as a votive offering. His humility about his awards and outstanding academic achievement was such that Vincenzo’s own father had to hear the news of his son’s accomplishments from third parties. Amidst the mental discipline of declining nouns, conjugating verbs, and parsing participles in Cicero, Ovid, and Virgil, the boy lost not a bit of his piety. The Collegio had been criticized for its overemphasis of the pagan classics, but all this seems to have left on Vincent is a fantastic aptitude in the Latin language. Not surprisingly, his piety drew him to a religious vocation. The particular avenue that most attracted the scholastic was the Capuchin Order, the Counter Reformation branch of the Franciscans.9 But the difficult life of a Capuchin Friar was seen as an impossibility for the frail boy and Fr. Fazzini told him that he would do better to aim for the secular priesthood. Vincent obeyed, but he joined the Third Order of St. Francis, and thus was a member of the Franciscan family, while not being a friar.10 In addition, he wore the rough habit of a Capuchin Friar every night as he slept, something he did on the floor with a marble slab as a pillow. Now that St. Vincent had a target to aim for — the secular priesthood — he took careful aim. At the tender age of 16, Vincenzo entered the ranks of the clergy. After a spiritual retreat at the Lazarist mission house, he was given the clerical tonsure on Easter Monday, April 15, 1811. This entitled him to wear the religious garb and to the title Abate . But the clerical garb had to wait three more years to be donned, for during the Napoleonic occupation of Rome, clerical garb was strictly forbidden among the young clergy. On May 26 Vincent was ordained to the four Minor Orders: Porter, Lector, Exorcist, and Acolyte. The teenage cleric soon became active in a number of confraternities, including the “Confraternity of Christian Doctrine” which was a program for catechists. Abate Pallotti, who already had practical experience teaching his playmates, was now a religious instructor with the official sanction of the Church. 1814 was a year of change both for Pallotti, and for Rome. May 24 of that year saw the Roman Pontiff, Pius VII restored to the city whence the pompous scoundrel Napoleon had driven him five years earlier. Autumn of this year was the commencement of Abate Pallotti’s career at the Universita della Sapienza. Otherwise known as the University of Rome, the Sapienza was a University along the lines of such European institutions as the Universities of Paris, Bologna, or Toledo. It was not a seminary, but had various courses of study, each with its own faculty. The theology school formed the academic part of a seminary training, but the remaining spiritual formation for future priests was left in the hands of the diocesan officials (for secular priests) or the religious orders (for religious priests). During much of his seminary years, Vincenzo went to a sort of weekend formation house. All the while, he lived at home with his parents. Vincent’s zeal for orthodoxy — without which sanctity is utterly impossible — was manifested during his University career in a paper he wrote against one Bodinus. It seems that this individual, some sort of critical exegete, had cast doubt upon the truth of the census that brought our Lady and St. Joseph to Bethlehem, so that the prophesy of Micheas11 could be fulfilled in Jesus’ Birth. In the Disputatio Contra Bodinum , Vincent wrote, “May therefore the profligate Bodinus become silent. May his teaching be corrected most vigorously and his paper be delivered to the fire by the beadle. He himself should let truth inspire him a little and duly respect divine revelation together with all true believers.” Seminarians today, in this age of effeminacy, would probably find themselves ex-seminarians very quickly, for writing so virulently. During this time, an extraordinary event occurred in the streets of Rome. In 1816, Vincent met a young man, two or three years his elder, who walked rather sadly down the street. His name was Giammaria Mastai-Ferretti, and he was a nobleman. His problem was that, although initially approved to enter the Swiss Guards — a position he greatly coveted — he was struck with epilepsy, and was refused admittance into the Pope’s elite corps. When the sympathetic Pallotti asked the nobleman what troubled him, Giammaria explained his plight. To this, Vincenzo responded, “Set your mind at ease. You will not stand on guard, but you will be guarded.” Mastai-Ferretti went on to become a priest, bishop, cardinal, and, in 1846, was elected Pope of the Church of Rome, taking the name Pius IX. The next sixteen years of Don Vincenzo’s life were a frenzy of priestly activity. Surprisingly, however, though he was a secular priest attached to the Roman Diocese, he wasn’t a “parish priest” in the ordinary sense, because he had no parish to call his own. In fact, he didn’t even live in a rectory or religious house; until 1834 he remained in his family home on 130 Via del Pellegrino. The young priest who lived with Mamma and Pappa Pallotti was seen in and around the City and its environs tending to a host of apostolic labors. In the midst of these good works he became acquainted with other dedicated individuals and forged lasting ties. But before we tread the path of Vincent’s apostolic footsteps, and before we are introduced to his holy friends, we would do well to comment briefly on his internal spiritual character, for he was a mystic, as we have said. As a person versed in piety from his youth, the future apostle well knew that, “Unless the Lord build the house, they labour in vain that build it.”14 An interior life is a prerequisite for anyone attempting to enter into the divine service. Without a life of devotion, of prayer, and of internal communion with the Blessed Trinity, the religious and apostolic life is not the dress rehearsal for Heaven it was meant to be by its Author but, instead, an arduous path to hell. Biographers can go on page after page trying to describe the interior life of a saint. For us non-mystics, these accounts sometimes read like tourist guides to very strange foreign cities; or better yet, like intricate descriptions of how some exotic Oriental dish tastes, when our idea of gourmet is a hot dog with brown mustard instead of just yellow . In order to spare the reader this torture, we will be sparing in our treatment of this subject. In these years, he also made some associations with various persons, priests, religious, and lay, who would later form, with him, the Society of the Catholic Apostolate. And during this time, he became conspicuous for working miracles. The hospice of San Galla, a refuge for homeless men, was one outlet for the young priest’s charity. There he tended to the bodily and spiritual hunger of the poor homeless by feeding them and giving them religious instruction. 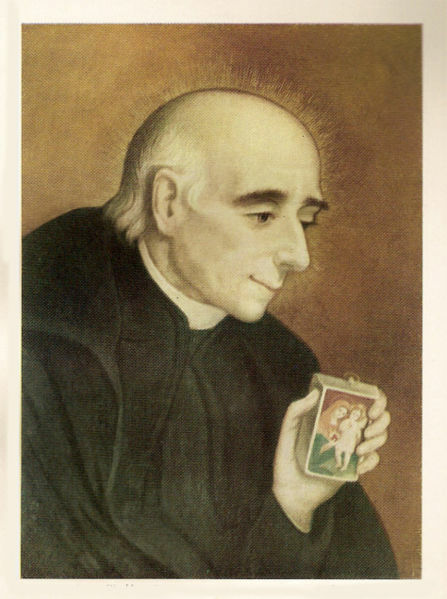 He was brought into contact in this work with St. Gaspar Del Bufalo (already mentioned), St. Vincent Mary Strambi, the Passionist priest18 , Giammaria Mastai-Feretti (the future Pius IX), and at least two future Cardinals. An organization that grew out of the work of San Galla was the Unio Antidaemoniaca (“Alliance against the Devil”). The Alliance worked to destroy sin by removing dangerous occasions of sin which presented themselves in the decadent art of the day. Members would destroy immodest art pieces, or take a chisel to the offensive parts of them. Because they were sensitive to the financial needs of shop keepers and others who made their living by selling such objects, they would often raise funds to buy the offensive art before they destroyed it. (Vincent’s Mass stipends sometimes provided the funds.) Included in the membership were artists who would “fix” art pieces in need of such attention. The Unio was one of St. Vincent’s extracurricular activities. His main occupation for the years 1819 to 1829 was that of a seminary professor. Cristaldi, the Rector of the Sapienza, asked him to be a Proffessore Supplente of the College. This gave him the task of giving daily instructions to the seminarians, summarizing the lectures of the main professors. He was, in reality, a tutor. Another part of his work as Professore Supplente was to direct the disputations and dissertations of the students. The students found in their professor a good theologian and a model cleric. Although he is thought of more as a “devotional saint” than a “theologian saint,” he did enjoy the reputation of being well studied in his science. Moreover, his example was remembered long afterward by the students. In the thirty-third year of his age, St. Vincent was assigned to a post which would not normally be entrusted to such a young priest. He was made confessor and spiritual director of the Roman seminary. The obligations of this office he fulfilled by daily walking to the seminary to hear confessions and give counsel to the seminarians. Even in the summer months, when the students were in the Villa Parioli (a two hour walk! ), their confessor was there twice a week to serve their spiritual needs. The influence Pallotti had on the seminarians was appreciated all around. He gained the reputation of a saint by giving sound direction, keeping the seminarians in the fear of God, showing them the example of mortification and prayer, and settling disputes that came up. This reputation was not limited to the seminarians; eventually, Vincent’s presence in the seminary confessional was taken as an open invitation for the neighbors to avail themselves of his services. This they did in droves, so much so that the seminary rector had to intervene to cut off the flow of penitents. It was not unheard of for the confessor to spend all day in the confessional. The eventual growth of his other activities would cut down Vincent’s trips to the seminary from daily ones to bi-weekly ones, but these he made faithfully and at great sacrifice. Sacrifice and mortification were a part of St. Vincent’s life as eating and breathing are to most people’s. Perhaps this is a good time to mention one hidden penance performed by the saint, since we have just mentioned his long walks to and from the seminary. Father Pallotti walked everywhere. Only when there was an emergency or when he was gravely ill could he be induced to take a carriage. So many of the famous stories in his life involve his presence in the street — being summoned by someone running from a house, finding a dying person and hearing his confession, etc. — that one pictures him walking all day in Rome. What was discovered after the saint’s death was that one of his toenails was severely ingrown. He did nothing to have it corrected and apparently never complained about the horrible pain it must have caused. Vincent wished to offer to the Infinite God “infinite penance.” His poor toe was just one victim of his generosity. The extraordinary phenomena that have accompanied the lives of many of the great saints were witnessed in St. Vincent. One of these was the cure of the daughter of Giacomo Salvati, the man mentioned in the beginning of this article. Salvati’s wife was surprised one day to see an unrecognized priest walk into her shop one day and ask, “Have you called me?” She replied that she had not and asked him who he was. “I am Abate Palloti,”20 he said. She then asked him if he would see her daughter who was upstairs, suffering from a condition diagnosed as terminal. Without having even seen the girl, he replied, “I shall go upstairs, but have no fear, your daughter is feeling better.” Shortly thereafter, the girl was found to be in perfect health. As early as 1830, Don Vincenzo had earned the reputation of a miracle worker. It was around that time when he visited the sick bed of a dying woman who was to receive the last sacraments. Lucia Fabiani was preparing to enter eternity as St. Vincent visited her. After several prayers and a few encouraging words aimed at stirring up the woman’s piety and trust in God and our Lady, he left. Barely was the priest gone when the woman reported to her husband, “I am healthy.” When the doctor came to check up on her, he exclaimed, “Don Vincenzo must have been here!” The doctor had not been told of the priest’s visit. Another miracle from his early priesthood happened in the confessional. While hearing the confession of one of his regular penitents, a carpenter named Giuseppe Marcozzi, Don Vincenzo seemed to have fallen asleep for four or five minutes. Two holy pictures he used to carry around with him fell on the floor of the confessional. Marcozzi picked up the pictures, kissed them, and called several times to his confessor. When the confessor came to his senses, he heaved a sigh of relief and told Marcozzi, “Let us thank God, the Pope has been elected!” “Who is it?” asked the curious penitent. “Capellari,” came the response. Right after his confession, the carpenter went to the Church of Santa Maria della Pace to attend Candelmas services and receive Holy Communion. Just after he arrived, the sound of a canon was heard in the distance, making people wonder what occasioned the signal. “The Pope has been elected!” he informed the curious people, revealing the name of Cardinal Capellari. Nobody had yet heard the news; but, true to the confessor’s words, the relatively unknown Camoldolese monk, Bartolomeo Capellari, was elected, taking the name Gregory XVI. In his interior life, he fulfilled St. Paul’s injunction to “pray always,” as well as the Apostle’s affirmation that “our conversation is in heaven.” The Three Divine Persons and the members of the heavenly court were those with whom he held familiar converse. The Queen of that court received special homage. While leaving his room, he would always look at an image of our Lady and say, “Bless me, my Mother.” Whenever summoned to someone’s deathbed, he first knelt down to say the Litany of our Lady (the Litany of Loreto). St. Vincent’s Marian devotion is memorialized in much of the religious art that depicts him. Like St. Benedict’s raven, St. Laurence’s gridiron, and St. Lucy’s eyes, there is a Pallottian symbol which will be an instant “give away” as to whether the priest in the statue is St. Vincent or someone else. It is the “Little Madonna.” The image is the Mother of Divine Love, our Lady seated, with our Lord standing on a pillow which rests on Her lap. Vincenzo had this image painted on ivory and mounted on a silver reliquary box. He very cleverly had it fastened to his wrist on a chain and, with apparently admirable dexterity, was able to produce it from his cassock sleeve faster than any Roman could kiss his hand. The respectful practice of kissing the hand of the priest — something Don Vincenzo did himself to other priests — was too offensive to the humble sentiments of that man who constantly called himself “nothing and sin.” So when anyone would attempt to reverence the priest’s hand, he would quickly find himself kissing the Madonna instead. The years 1834-35 are landmarks in the life of St. Vincent. In 1834, he took a parish assignment at the Church of Spirito Santo, the Neapolitan National Church located in a poor section of the city on the Via Giulia, not far from the Tiber. 1835 was the founding year of the Society of the Catholic Apostolate, the religious congregation and lay movement which would carry on Don Vincenzo’s work after he took his flight to heaven. The coinciding of his assignment at Spirito Santo with his founding of the Society seemed to be something written in an eternal decree. It sometimes happens that God reserves the worst chastisements of his faithful servants for the eve of their greatest accomplishments. This fact is brought clearly in the life of the Apostle St. Paul, who preached Christian liberty most effectively when he himself was a prisoner. When St. Vincent was appointed Rector (superior of the house) over five undisciplined, insubordinate, and ill-willed Neapolitan priests, he was presented with a treasure of meritorious suffering which would bear fruit for the work of his apostolate. A life of a Saint is supposed to be something edifying, informing the intellect of good things, and moving the will to the love of God, Who “gave such power to men.”22 To recount the evils done to St. Vincent by these unworthy priests would only fit into that agenda if the admirable patience of the saint were made the focus, not the wickedness of his underlings. For one thing, these Neopolitans were very nationalistic, and probably should not have had a Roman as their superior anyway. They were also jealous of St. Vincent’s priestly zeal, for during his rectorship of the Church, the shamefully demoralized state of the parish was renewed and Spirito Santo became a center of devotion and religious fervor. Their disdain for St. Vincent showed itself in a variety of uncharitable acts on their part, including hiding things on him in the sacristy (like the tabernacle key and hosts for Mass! ), removing his confessional, so that he had to go elsewhere to confess his legion of penitents, going to great trouble to make sure he had dirty altar linens and candles that would burn out in the middle of Mass. In addition, they constantly complained about him to ecclesiastical superiors and did everything they could to destroy his apostolate by preventing the Society from having meetings in the parish. It can be said that he deserved this treatment. Why? The answer is simple. “Ask and you shall receive.”25 In the beginning of 1835, before he took his post at Spirito Santo26 and before the Society was founded, he offered a prayer which is recorded in his notes. Among other things, he asked “that some be found among Your creatures who, in accordance with Your spirit, despise, beat, torture, and humble me so that I may bridle my evil passions, especially my pride. Permit that all creatures even chafe, beat and humble me at all times for Your glory and my deserved shame…” He said this prayer because he felt called to begin a great work, and wished to be purified by the purgatorial fires of suffering so that the work would be blessed. In his notes of 1835, St. Vincent describes the work that he felt called to commence. “My God… allow me… to promote, establish, propagate, perfect, and perpetuate the pious institution of a universal apostolate for all Catholics, in order to propagate the faith and religion of Jesus Christ among all infidels and non-Catholics; another apostolate to revive, conserve and increase the faith among Catholics; and an institution of universal charity in the practice of all the spiritual and corporal works of mercy, so that You may be known in the world by a reflection of Your infinite charity.” This was the spark which would soon ignite into the Society for the Catholic Apostolate. What kindled the spark into a fire was a need brought to the attention of Don Vincenzo to help Oriental Catholics who were in a sad state of affairs. Years before he had made the acquaintance of Tomasso Alkuschi,27 who told him of the pitiful state of the Catholics of Persia, whose schismatic Nestorian compatriots mocked them for not even having a church for services. At that time, Don Vincenzo sent out a letter to the whole Catholic world, encouraging them to give generously, especially if they loved our Lady, because the defeat of Nestorianism would be a victory for our Lady.28 The earlier efforts had borne fruit, but now something more could be done. A missionary in the Middle East sent a request for ten thousand copies of St. Alphonsus’ Eternal Maxims in Arabic, so that he could distribute them to the missions in the Arab world. Such a thing seemed hardly possible, but the saint, encouraged by his friends, decided to fill the request. Don Vincenzo lost no time. He sent the faithful Giacomo Salvati into the streets of Rome to raise the funds needed for this ambitious project — four hundred scudi, a large sum.29 Salvati was scared by the project, asking to be excused for his lack of competence. But Pallotti was unrelenting. Giacomo then asked if at least his master would give him a letter that could be shown to the Roman shopkeepers he would be soliciting, so that he might raise the funds in the name of Vincent Pallotti. The priest refused, planted a Crucifix in Salvati’s hand, and said, “Ask in the name of Jesus Crucified!” After only a few hours, the collector of alms returned with over five hundred scudi, something he thought hardly possible. The thought that they had too much money was something of a conscience problem for Abate Pallotti. He told Salvati to return the money, but Salvati raised the objection that he could not possibly remember who had given how much. It was decided that the ten thousand Arabic books would be printed and that whatever was left over would be used to print pious books in Italian to be distributed for free. This required administration and coordination, priestly overseeing and lay activity. His request of God to begin a universal apostolate must have flashed back into his mind. These activities and others like them could be increased! The spare scudi must have been a sign! Thus, in the calm words of the Founder, “…it was thought convenient to create a Pious Society which, in the present state of necessity of the Church, would have for its purpose the multiplication of such spiritual and temporal aids as are necessary and opportune for reviving faith and rekindling charity among Catholics and spreading these virtues throughout the entire world.” The Pallottines were born! Of course, it goes without saying that they were not called “Pallottines” until after the Saint’s death. St. Francis didn’t name his Friars Minor the “Franciscans,” and neither did St. Dominic choose to name the Preaching Friars the “Dominicans.” But while the new name had to wait until after the Founder’s death, there was still quite a bit of change in the Society from its inception in 1835 until Vincent went to heaven. For one, the original Society was not a religious congregation in itself, but rather more of an umbrella institution for linking, coordinating, and unifying the spiritual, missionary, educational, and charitable goals of existing institutions. In other words, St. Vincent wanted to get all of the oars of the Barque of Peter rowing in the same direction. Thus, Cardinals, bishops, secular priests, monks, nuns, religious of all sorts, and lay people of every walk in life were all welcome to join the Society to further its missionary ends and contribute their own talents. In return, they would be blessed with the merit of good works, and the rich spiritual bouquet of indulgences granted by the Supreme Pontiff to the new organization. We have seen that St. Vincent’s Society was founded along the broad lines of increasing Faith and Charity in the whole world. When he sent out the plans for his new Society to the superiors of religious orders, he received a very positive response. One of the superiors commented that this Universal Apostolate was an all-out effort to return the Church to its primitive fervor. It is likely that that comment pleased the Founder very much. Something symbolic of the Universal Apostolate is the Mystery of Epiphany. More than just symbolic, though, this Mystery lies at the very core of the Church’s identity. The Manifestation (Epiphany) of our Lord to the non-Jews is what gives the Church of Christ its note of “Catholicity,” or Universality. The Old Dispensation had its chosen race, but the New Dispensation united that race —”as many as received Him”32 — to the believing Gentiles, “breaking down the middle wall of partition”33 in Christ. The Feast of the Epiphany, which the Church of Rome celebrates on January sixth, has an octave extending to the thirteenth. Since this Feast is the perfect liturgical expression of the Universal Apostolate envisioned by St. Vincent, it had a great significance to him. (The Pallottine seal has the Star of Bethlehem on a black field, thus representing this Mystery.) Pallotti created a special celebration of the Octave of the Epiphany that was both a large-scale popular mission and a vivid display of the Church’s catholicity. Mention has been made of Tomasso Alkuschi, the Persian Catholic, as well as St. Vincent’s interest in helping Arabic-speaking Catholics. The faithful of the Arab world are generally Eastern Rite Catholics, a part of the Church all too forgotten today. Aside from Alkuschi, the Founder had other Eastern Rite connections. He became a good friend of Mother Makrina Mieczyslavska, the Russian Rite nun who escaped the persecution of Czar Nicholas I and sought refuge from Gregory XVI.34 He was also confessor to the Greek College in Rome. Among the first monastic communities to join the Society of the Catholic Apostolate, was the Armenian Rite Mekhitarist Monastery of San Lazzaro in Venice.35 The very first meeting of the Society, on July 14 of 1835, was in a Maronite Church, Santa Maria in Carinis. And the first location of the Pious House for girls was a home owned by a Melkite Catholic. All of these connections of the Roman priest to the Oriental Rites gave him a thorough appreciation of the catholicity of the Church viewed in its liturgical variety. It is not surprising, then, that the Pallottian Octave of the Epiphany was, for one thing, a showcase of these beautiful rites, right in the heart of the Catholic world. The Octave still takes place in Mt. Carmel Church in New York. Thus, in 1996 (the most recent program the author has access to), attendees assisted at the following rites: Solemn Latin Tridentine Mass, Ghe’Ez Rite (Ethiopian); Ukrainian Divine Liturgy; Coptic Divine Liturgy; Syrian Divine Liturgy; Maronite Divine Liturgy; Ruthenian Divine Liturgy; and Italo-Albanian Divine Liturgy. 1837 was a year filled with death for the Roman Apostle. In that year, he lost two fathers. First, Pietro Paulo Pallotti died. The year before, Signor Pallotti had taken ill, and Don Vincenzo went to visit him. He made the strange statement that, although his father would recover from the present illness (1836), he would die a year later, and without Vincenzo’s priestly assistance. On September fifteenth, of 1837, Pallotti told his father to go to Mass and receive Communion. Signor Pallotti said that he had received within the last two days, but he followed his son’s advice. After returning from the church, death overtook him suddenly in his shop. His spiritual Father, Don Fazzini also died that year, having the consolation of his saintly penitent’s child- like assistance during his hard death-struggle. This was, no doubt, a reward for guiding Pallotti for thirty years in the ways of sanctity. June 9 of that same year saw the death of the visionary Blessed Anna Maria Taigi. She had been a friend of St. Vincent and had even assisted him personally with her prophetical powers. Taigi had the gift, hitherto unknown in the records of sanctity, of a “sun” which always hovered near her, which she alone could see. The sun would give her prophetical visions which had been of benefit to more than one Pope who received messages from her. Father Natali, Bl. Anna Maria’s confessor and spiritual guide, related the story that on one occasion Vincent sought help. When a relative was missing, and was feared to have drowned himself, Vincenzo appealed to Taigi, using Father Natali as a go-between. Taigi looked into her sun and discovered the location of the relative, who was found according to her directions. Pallotti regarded this seer as a saint in life and after death. It is said that St. Vincent made Taigi his “secretary general” with God in all his apostolic endeavors. There is a common cliché uttered by one who trusts powerful men to come to his assistance in times of difficulty: “I’ve got friends in high places!” If such a saying of the world may be “baptized,” then St. Vincent surely could have uttered it. His friends included some who have been solemnly declared by the Church to be in high places. St. Gaspar Del Bufalo, St. Vincent Mary Strambi, and Bl. Anna-Maria Taigi have all been mentioned. We can add to the list others reputed for sanctity. Ven. Elisabetta Sanna, a Sardinian woman whom he had met as a young priest, is one. Another is Ven. Sister Maria Luisa Maruizini, whose extraordinary confessor St. Vincent had been. (After the death of Sister Maria Luisa, Vincent’s brother was cured of a crippling leg ailment after visiting her grave at the suggestion of Vincenzo.) Deserving of mention, too, are Bl. Pauline Jaricot, and Ven. Bernardo Clausi, a Minim Friar, both of whom we will hear about later. Of all the holy people St. Vincent was close to, it seems that the Founder of the Congregation of the Precious Blood was the one most intimate with him. The relationship of St. Gaspar to Pallotti has been compared to that between Sts. Dominic and Francis. It had even been suggested (by St. Gaspar) that they merge their two foundations into one Congregation, but Pallotti respectfully declined the offer after careful consideration. The aims of the two societies were too different. So, like Francis and Dominic, they kept their congregations separate, but the saints remained spiritually inseparable. With official approbation for his Society from Pope Gregory XVI (July 11, 1835), Don Vincenzo had by no means finished his great work. He had only just begun to fight. And fight he did. He declared a war — with his army of twelve in the Society — for “the annihilation of sin.” That same year he became confessor of the Seminary for the Propagation of the Faith, the Roman seminary for foreign missionary students. Thus, his goal of extending the True Faith in foreign lands was being met by spiritually forming missionaries. 1836, in addition to being the first year of the Octave of the Epiphany celebration, saw him in a number of charitable roles. These included: providing more care for orphan girls, sending great quantities of rosaries, vestments, and chalices to Asia, Africa, America, and Australia. In 1837 he was named councilor on the Central Council of the Society for the Propagation of the Faith (not to be confused with the Seminary, mentioned above). This was the missionary work founded by the pious French woman, Blessed Pauline Jaricot. Don Vincenzo greatly admired the work of this Society, and he preached sermons encouraging people to join the work and donate generously to its foreign missionary efforts. He prudently encouraged Bl. Pauline to make the headquarters of the Propagation in Rome instead of Lyons, France. The holy woman did not follow his advice, and as a result the Society for the Propagation of the Faith was soon disciplined by the Church for aggregating to itself too much control of the Church’s missionary activity, to the detriment of Roman authority. In 1922, further measures were taken by Pope Pius XI, who subdivided and de-centralized the Lyonese Society. St. Vincent’s advice proved prophetic. It did not take a lot on the part of St. Vincent to convince Gregory XVI to retract the suppression. The Pope wasn’t responsible for it anyway, and was not pleased with the turn of events. The Catholic Apostolate was saved, and after long negotiations, their differences with the Propaganda Fide Society were settled. In the meantime, the priests and brothers of the Catholic Apostolate had taken up residence in the Neapolitan Church. This entailed St. Vincent’s moving out of his parents’ house for the first time in his whole priesthood. It also entailed suffering the wrath of the five unworthy Neapolitan curates even more, for now their rectory was crowded. The miracles for which St. Vincent was reputed early in his priesthood continued as his work broadened. From 1840, after the saint returned from a “forced retreat” (due to sickness) at Camaldoli, date a number of such incidents. Filippo Focardi’s wife, who was close to death, revived when St. Vincent blessed her with the “Little Madonna.” He consoled her by promising to return to her when he was needed. On the night that she entered the throes of death, one of the family members was rushing out of the house to fetch the parish priest only to be met at the door by Don Vincenzo. As in the case of Del Bufalo’s death, he cast aside his usual calm demeanor and rushed upstairs, declaring, “She is going to eternity!” Seven minutes later, she died, accompanied by the prayers and blessing of the Saint. On another occasion, he was traveling with one of his loyal confreres, Don Rafaele Melia. Melia was surprised when his superior took a sudden wrong turn. Don Melia’s natural reaction to point out the mistake was met by an urgent, “This way, this way!” Soon a frantic lady rushed toward the priests informing them that a woman was dying. Declaring “Have confidence!” Pallotti blessed the dying woman with the Madonna and she was cured. There is a footnote to the story of the woman who was cured. His words, “Have confidence!” and another phrase, “Let us resign ourselves to the will of God and pray for this person,” were part of a code which Venerable Elisabetta Sanna cracked. Sanna, who had met Vincent under extraordinary circumstances, became one of his most devoted disciples. She had witnessed countless such visitations to deathbeds and noticed that when the “Confidence!” phrase came out of her confessor, the person was always cured, but when the second phrase was uttered, it meant certain death. There were also instances of bilocation. One involved a pair of young men whose custom it was to confess to St. Vincent every week at Spirito Santo. Though they normally came together every week, once one told the other to go ahead of him and that he would catch up. While in the middle of the first boy’s confession, Vincent suddenly interrupted his exhortation to the young man and grew silent. A moment later, he commanded, “Offer your Holy Communion for the peace of the soul of your deceased friend!” After confession, the young man hurried to his friend’s house, to find him dead. The dead boy’s family reassured the saddened young man that he had just died in the arms of St. Vincent. At least three such cases are documented, including one which happened at Sant’ Andrea della Valle, during the Octave of the Epiphany. A woman of ill-repute was dying and in need of a priest. Pallotti was in the confessional, where twice he was approached to come quickly and assist the woman. He replied that there was still time and continued to hear confessions in the Church. As he was hearing a man’s confession, he suddenly became motionless and trance-like. Returning to his senses, he exclaimed, “Let us thank God for his mercy!” As the penitent was leaving the Church, he received news that the woman had died a good death, assisted by Saint Vincent. This happened at the exact same time the man was in the confessional. A letter from London, addressed to the Prefect of the Congregation for the Propagation of the Faith, arrived on December 28, 1845. It was from Vincent’s loyal disciple, Don Raphaele Melia. In it, he described the woeful conditions of the Italian immigrants in London, with whom he had spent the last fourteen months. Don Melia’s presence in London is representative of both the ardent desire of his master to extend the Church’s missionary effort, and of his self-sacrifice in fulfilling that end. Pallotti had great need of Melia, who was a key member of the fledgling foundation, but he selflessly sent him to London in September of 1844. It is somewhat reminiscent of the way in which St. Dominic, after barely banding together his Order, dispersed them all over Europe — bringing upon himself the accusation of recklessness. The English mission of Melia was very specific and at the same time was part of a general movement. The Sardinian national church in London, which existed to serve Italian (Sardinian) immigrants, was in need of a chaplain. This was the immediate goal, and Melia could fill the position. More than that, though, there was a greater movement of which it was just a part. England was once called “Our Lady’s Dowry,” but since the Protestant Revolt, became known to Catholic Europe as perfida Albion — “perfidious England.” But eager talk was going all around the Catholic world of England’s conversion. The Oxford movement, which was bringing men like John Henry Newman and Fr. Frederick Faber into the Church, was the source of this hope. Faa di Bruno proved himself an effective apologist, and had public disputes with the Protestant “Mr. Cummings.” He wrote a book in English called Catholic Belief , which saw more than 30 printings, and in the U.S. alone had sold 200,000 copies before 1952. Melia and Faa di Bruno each in turn succeeded Vincent as Rector General of the Order and they both proved worthy missionaries. Don Faa di Bruno was responsible for the introduction of the Society in North America by sending Fr. Aemilian Kirner to New York City to found Our Lady of Mt. Carmel Parish. Meanwhile, back in Rome, the Founder was busy with caring for souls in a number of ways. On the day of the General Judgment, St. Vincent will be one of those on our Lord’s right who hears those blessed words recorded in St. Matthew’s Gospel: “For I was hungry, and you gave me to eat: I was thirsty, and you gave me to drink: I was a stranger, and you took me in: naked, and you covered me: sick, and you visited me: I was in prison, and you came to me.” (Matt. 25: 35-36) On that day, he would be able to check each of these six items off as something he performed in an heroic degree. In 1843, he was made chaplain at the military hospital at Cento Preti, where he was to tend to the spiritual needs of the Italian soldiers. In the late forties, he continued with greater intensity a work he had begun as early as 1838, working with the inmates of various Roman prisons. The prison apostolate was not unlike another work he had been involved in around the time of his Society’s foundation, converting criminals condemned to death. It deserves brief mention that Don Vincenzo had tremendous success with the condemned. He worked with the arch-brotherhood of San Giovanni Decollato (“Saint John Beheaded”), whose members did penance for those we now call death-row inmates. The Papal States did have capital punishment, as all civilized Christian societies had. (This may be a surprise to those whose liberal view of the “culture of death” perversely puts executing murderers on the same par as murdering innocent babies.) Part of being Christian also meant looking out for the spiritual welfare of the condemned, and the state was quite interested in this end, too. For this reason, execution days in Rome were days of prayer and penance. St. Vincent was the last recourse of many prisoners. Whenever the work of bringing the condemned man to penance proved impossible for the members of the arch-brotherhood or their chaplain, they called in St. Vincent. In all, he converted seven such criminals between the years 1835 and 1846. Only in two cases did his efforts meet with failure. The soldiers’ hospital was the scene of many miracles of grace wrought through the saint. In 1844 the hospital was transferred to another part of the city in a large gallery building called Corsia di San Carlo (Saint Charles’ Hall). One day, Don Vincenzo took a walk to this hospital with a young French priest who had recently joined the Society. Father de Geslin tells the story himself, much to his own mortification, since the whole story begins with his master rebuking him for not observing evangelical poverty and offending God’s Providence. Pére de Geslin received a letter, which came with a blank piece of paper in the same envelope. When he routinely threw the envelope, letter, and blank paper into the fire place, Pallotti rebuked him for being wasteful. To remedy the situation, de Geslin was to take the blank page, and others that had collected, into the streets to find a ragman who would buy the scrap. When the ragman was found, Don Vincenzo accepted his offer (which de Geslin considered too low) and pocketed the small amount of change. The two priests then left for the hospital, stopping at a grocery to purchase a box of biscuits with their change on the way. “He did not begin as I would have thought. First, he spoke with a few neighboring patients, glancing now and then at the man without being noticed. The latter began to mumble as soon as he saw Don Pallotti, and made a horrible face which was quite frightening to behold. “And, after a while, as nothing seemed to happen, he turned and, without relaxing his expression, closed his eyes. But only for a moment, for in that time, the good priest arrived unnoticed by his bedside. When the man opened his eyes, they met those of the priest, who was already blessing him. “He hurried to swallow the biscuit in order to start up his horrible litany. But despite his efforts, he could not swallow very quickly, and his charitable visitor had time to speak to him. “His biscuit finished, the patient once again opened his mouth in order to utter a blasphemy, when a second biscuit was introduced with the same result, A second exhortation followed without, however, provoking a change in the patient’s expression. He was no doubt waiting for his aggressor’s ammunition to run out. Mistake. The pockets were full — an arsenal of cookies. This went on for some time, with always the same results. The good father knelt by the patient; at one moment he pleaded with his own tears that the man have pity on his poor soul; the next minute, he exorcised him, or he prayed for him. Now and then he blessed him with a holy picture of the Virgin and Child which he always carried around. He had the patient focus on this picture full of smiles and forgiveness. He begged him not to die this way, so that at the Last Judgment, they would be together at the right hand of God. “After a while, divine grace seemed to do its work, and it seemed that the patient’s expression showed some repentance. Don Vincent suggested an act of contrition which the moribund seemed to agree to. His lips no longer refused the crucifix, and soon tears sprang from his eyes. The Father passed his violet stole around his neck and very quietly murmured a confession to which the dying man answered with an affirmative nod of the head and words inaudible to the rest of us. “When it was over, the priest motioned to me to prepare everything for the last rites. With only three biscuits gone, all blasphemies had been eliminated. From that moment on, the moribund generously accepted death. “He received Extreme Unction and the Holy Viaticum in sincere repentance. As I had come closer to hold the candle which must burn during the holy unction, I heard him repeating the names of Mary and Jesus after the priest. His last words were: ‘Jesus, Mary, and Joseph, help me in my last agony.’ He died before nightfall. A similar story is that of Pio Bossi, a soldier whom St. Vincent tended to in his home, where he was dying. Because we let Fr. de Geslin get rather longwinded about the first story, Pio’s will only be outlined. The young soldier was demoralized and had been infected by Masonic ideas. He was sent home from active combat because of a serious physical illness. Bossi’s family feared him to be dying, and feared worse where he was headed after this life. There was one practical problem in getting him a priest; Bossi had a loaded gun at his bedside and swore to kill any priest who walked in the room. But Vincent (whose name means “conqueror”) was able to conquer this soldier. He disguised himself as an old woman and, under the pretext of giving the family a break from tending to his sick bed, the priestly “old lady” entered Bossi’s room. This was at night, around bed-time. To make a long story short, the next morning, the family found neither the “old woman” nor an impenitent Pio; they found Father Pallotti together with their genuinely converted prodigal. Since January of 1846, the Society and its Founder had taken up residence in the Church of San Salvatore in Onda, a Conventual36 Franciscan monastery which was given to them by Gregory XVI.37 On June first of that year Gregory XVI, who had been such a generous benefactor of Vincenzo’s work, died. Saint Vincent was given the grace some months later to know that Gregory had entered heaven that morning. (When asked how such a holy Pope could be so long in Purgatory, the Saint said, “God’s mills grind carefully.”) We regret that Father Pallotti’s relationship with Gregory XVI could not be treated more fully in these lines. As for his successor, we are obliged to write of him a little more. The story was told above about how Mastai-Feretti had his future Papal vocation foretold to him by Vincenzo. But this episode in no way implies that the two were birds of a feather. St. Vincent stood in stark contrast to the rest of the Roman populace, which was greeting the new Pope everywhere with confetti and shouts of “Evviva Pio Nono! ” St. Vincent kept repeating, “The voice is Jacob’s voice, but the hands are of Esau.” He did not trust the new Pope’s popularity as a sufficient barrier against the Italian Liberals’ conspiracies. He was waiting for God’s severe judgment to fall upon Rome. Once again, he proved to be a prophet. The Masonic infection in Italy has been referred to many times in this article. These liberal nationalistic ideas — like those of their cousins, Communism and Zionism — were not merely in the intellectual realm. Like their cousins, they grew into action. Clausi replied, pointing up, “I go to grandfather and grandmother, but after another month we shall see each other again up there.” Clausi died in December of 1849, in the Minim monastery of Paola. On January fourteenth, St. Vincent said Mass before the miraculous image of the Mother Most Admirable at the convent of Santa Trinitá dei Monti. As he was leaving, he told Mother Makrina, the Russian Nun, that this would be the last Mass he said there. Two days later he took ill at the home of James Salvati. He was diagnosed with pleurisy. Giving away his cape to a cold pauper during the Octave apparently brought on the illness. Thin cassocks just aren’t warm enough in January, even in Rome. When Elisabetta Sana heard that her confessor was gravely ill, she quickly made her way to San Salvatore. Father Vaccari greeted her at the door. When he told the sick priest that Sana had arrived, Pallotti cried out, “Tell Elisabetta that I hope to be able to leave the bed soon. Prayer and submission to God’s will!” Vaccari was happy to deliver the news, but his happiness turned into confusion when Sana burst into tears upon hearing it. She knew the “code,” and the part about “submission to God’s will” told her Vincent was dying. He would leave his bed because he is headed for the grave. His death was the kind of death we should all pray to have. He received the Last Rites, reciting the words with the priest administering it. He blessed his little community and encouraged them to perseverance. “Do you know what a beautiful feast there is tomorrow? It is the wedding feast of the Mother of God, and there will be great joy in heaven tomorrow.” He was referring to the Feast of the Espousals of our Lady on January 23, of special significance to him because he was mystically wedded to that great Spouse. His spiritual sons tried to induce him to stay in this life, after all, he had cured so many others. “My God, my God! Please, please, let me go, to wherever God wills!” he said. He fell further into the bed and repeated, “Please, please, let me go, to wherever God wills!” Half an hour later, after once again receiving sacramental absolution, he died. That night, while she was weeping in her room, Elisabetta Sana saw a vision of Don Vincenzo. He was clinging to the Crucified Redeemer, Whose sacred wounds shed a light of glory around Pallotti. 5 These were not in Vincent’s immediate family. One would include his nephew, Luigi Pallotti. 7 Though the author does not fear the general outbreak of such penances among our youth as a result of his article, he still feels obliged to say that such austerities as these are recommended only under the prudent guidance of a competent priestly spiritual director. 8 “The Piarists” was the popular name given to the “Canons Regular of the Mother of God of Pious Schools,” the religious congregation founded by St. Joseph Calasanctius. It was St. Joseph who founded San Pantaleo school. The very room where St. Vincent attended classes was where St. Joseph was gifted to receive a visitation of the Blessed Mother, and the staircase he daily ascended to go to school was the scene of St. Joseph’s miraculous healing of a boy whose eye had been plucked out. 9 This branch of the Franciscan tree has given the Church one of our most famous and most recent blesseds: Blessed Padre Pio. 10 The Franciscan Third Order boasts many saints and other famous people: St. Pius X, St. John Marie Vianney, St. Louis of France, Christopher Columbus, and Dante were all Third Order Franciscans. In addition to being a Franciscan Tertiary, Vincent also belonged to the Third Orders of the Dominicans, the Minims of St. Francis of Paola, the Carmelites, and the Trinitarians. 13 Those doing their math may have noticed that Don Vincenzo was only 23 years old at the time of his ordination to the priesthood. This was one year short of the canonical minimum of 24; therefore it was necessary to have proper dispensation to ordain him. 15 According to the most authoritative biography of St. Vincent we have (Fr. Weber’s Vincent Pallotti: Apostle and Mystic ), it is not known whether St. Vincent had read the writings of St. John of the Cross, or had gotten his teachings from secondary sources. 17 The trivial spirituality that exists among the “charismatics” of our day reduces God to a cosmic “Sugar Daddy” and has no place for this type of holy fear. One book the author has seen refers to the “huggable, snuggable God.” St. Vincent would have blasted this type of silliness. 18 St. Vincent Strambi learned the ways of sanctity right from the founder of the Passionists, St. Paul of the Cross. 20 Abate in Italian is equivalent to Abbé in French. It refers to any cleric, from the tonsured seminarian to a priest. 21 Bl. Allen de la Roche, the disciple of St. Dominic, for one. 23 There is an ambiguity in the names here. During the early years, St. Vincent changed the name a few times, forced to do so by complex circumstances. Eventually, the name “Society of the Catholic Apostolate” was suppressed and the men’s Congregation was named the “Pious Society of the Missions” (PSM). The original name was restored by Pope Pius XII and since that time the Pallottine Priests and Brothers are SACs (in Latin, Societas Apostolorum Catholici ). To clarify the ambiguity between the larger Society containing all three parts, and the male religious congregation at its core, the larger entity was renamed the Union of the Catholic Apostolate some time after Vatican II. 24 This is not to say that he was anti-hierarchical. Anyone who reads his life or works knows that the opposite is true. The bishops, priests, religious, and lay members each had their distinct dignity according to their state in life, but all are equally Pallottine. 26 There are apparently conflicting reports in the various biographies, which assign either 1834 or 1835 as the year of his becoming rector at the Neapolitan Church. It seems that he was assigned the post late in 1834, but did not take his office until sometime after the beginning of 1835. 27 Alkuschi was a Persian, apparently born in Armenia. He was a Chaldean Rite Catholic (see next footnote) and professor of Oriental languages in Rome. 28 Nestorianism is the heresy condemned by the Council of Ephesus in 431. They denied that Mary is the Mother of God (Theotokos , literally “God Bearer” in Greek), saying that she was merely the Christotokos , or “Christ Bearer.” Hence, to them, Jesus was two persons, one divine, the other human. The Catholic Church teaches that He is one Divine Person with two natures (human and divine). Any Protestant who says that Mary is not the Mother of God, but just “the mother of His humanity” has accepted this heresy. Persia and India became havens for Nestorianism, and the heresy still exists in the East, especially in Iraq. The Catholics of Iraq are of the Oriental Rite known as Chaldean. There are Chaldean Catholics in America, mostly in Chicago, Detroit, and various cities in California. 29 The sum was estimated at $1,200.00 in 1980. One has to consider U.S. inflation since then, as well as the fact that the funds were needed in 1835, to appreciate the value of the sum. 30 There is an ambiguity in the names here. During the early years, St. Vincent changed the name a few times, forced to do so by complex circumstances. Eventually, the name “Society of the Catholic Apostolate” was suppressed and the men’s Congregation was named the “Pious Society of the Missions” (PSM). The original name was restored by Pope Pius XII and since that time the Pallottine Priests and Brothers are SACs (in Latin, Societas Apostolatus Catholici). To clarify the ambiguity between the larger Society containing all three parts, and the male religious congregation at its core, the larger entity was renamed the Union of the Catholic Apostolate some time after Vatican II. 31 This is not to say that he was anti-hierarchical. Anyone who reads his life or works knows that the opposite is true. The bishops, priests, religious, and lay members each had their distinct dignity according to their state in life, but all are equally Pallottine. 34 For Mother Makrina’s story, see From the Housetops #41. 35 The Mekhitarists are named after Venerable Mekhitar of Sivas (1676-1749), an Armenian Monk who entered into union with Rome and in 1701 started a monastic foundation of the Armenian Rite. Pope Clement XI formally approved them in 1711 as a Congregation following the Benedictine Rule. 36 The Conventuals are the Franciscan branch to which St. Maximilian Kolbe belonged. 37 In this house had once lived the Franciscan Saints, Peter of Alcantara, Giacomo della Marca, Amadeus of Portugal, and John of Guadalupe. It had also been the home of two Conventual Popes, Sixtus IV (+1484) and Sixtus V (+1590). 39 It is unknown to us whether or not the ironic selection of Bastille Day was deliberate.